Spring was really awesome here in Phoenix this year, and our garden really produced some amazing herbs and vegetables! I mean, c'mon. 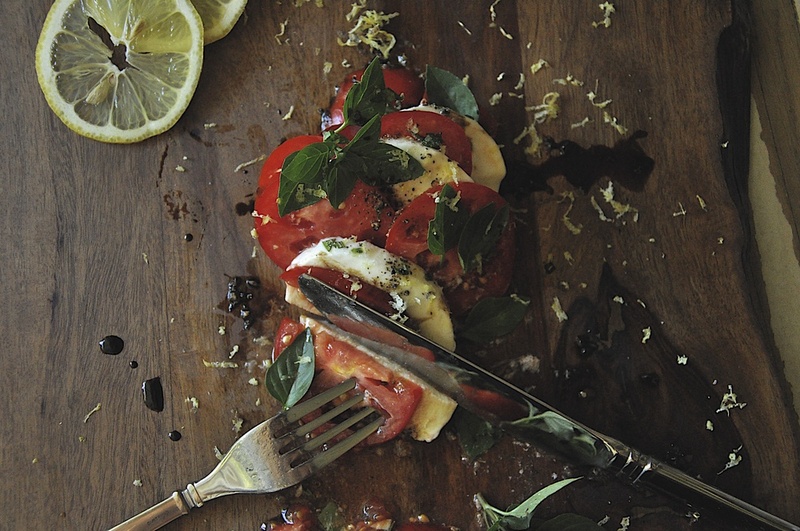 Huge red tomatoes, perfectly perky small- leaf basil, spicy peppers and luscious strawberries. Everything just blew up! The little specimens just love that Arizona sun. My Mom always told me that I had a gift in the kitchen, and that one day, I would use those skills to make some lucky woman very happy, and that she would fall in love with me. Well, Mom, it worked. I don't like to think of Maryal as "lucky" to be with me, but I do know for certain that I won her heart over with a slammin' chicken dinner that I stirred up one night at her place! I mean, she just melted. She stared into my eyes as she ate every morsel in front of her. I'm proud of every dish I make for us, and carefully prepare each component with love, so I thought that once in a while on the blog I would share some of my go-to moves in the kitchen, and also incorporate the herbs and veggies that are growing in our little organic garden. Keep it local! Bon Apetito! 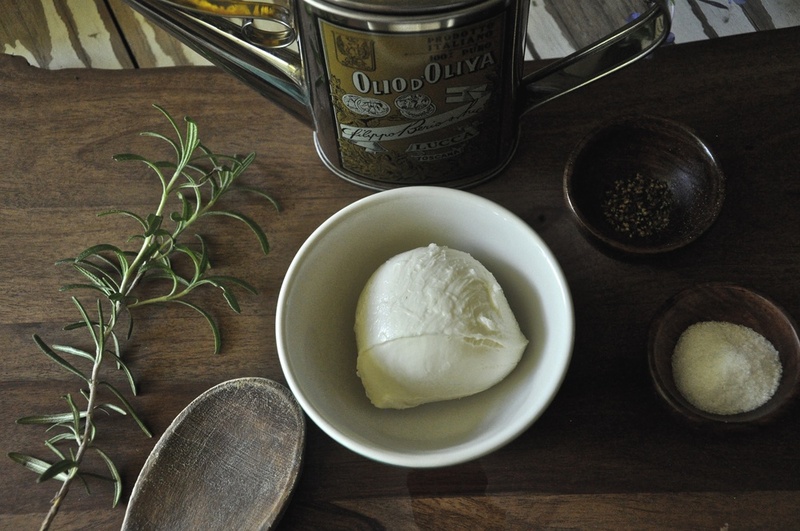 The local grocery : Find some really tasty olive oil, sea salt, black pepper, balsamic vinegar, and you'll also need to find some fresh mozzarella cheese - the kind that floats in the weird tub of water. Yo'll only need one tub if you're making a couple salads. I like to try and find locally made cheese, but for this meal I used BelGioiso Fresh Mozzarella. I like it because it has a clean flavor, and is delicate and creamy. Magnifico! The garden: I have a bush of small leaf basil and carefully snatched some of the branch tops, where you'll find the dense clusters of perfectly pointy little leaves. You need a couple nice tops for this meal. I want to add that the more you pick your basil, the more it will grow, so eat up! I also grew several varieties of tomatoes this year. The Campari tomatoes' size and color stood out this week, so I set four of them aside. You wait until they change color, almost ripen on the vine, then pick 'em, and let them finish sweetening up on the counter. Rosemary - I grow it and love it for it's versatility. You just need one good clipping. Pull the leaves from the stem of Rosemary and finely chop. Slice your tomatoes and lay them out on your cutting surface. 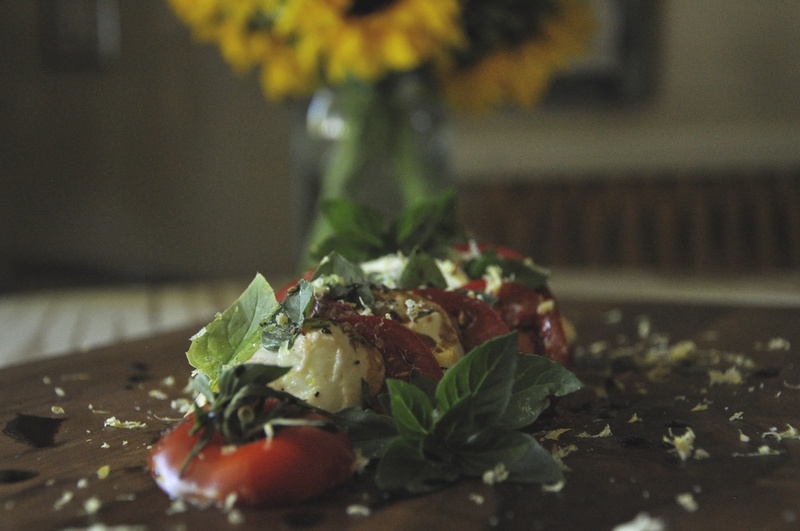 Pull the leaves from the basil clusters, leaving the very tips untouched for the garnish. 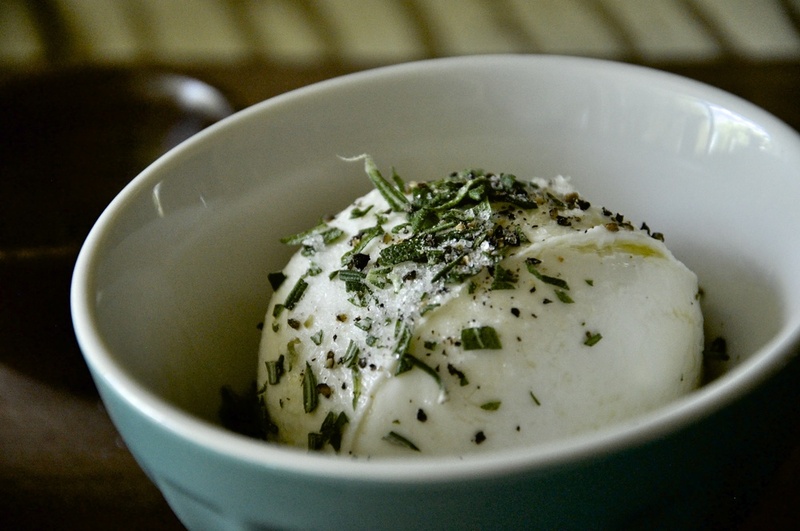 Place a ball of fresh mozzarella cheese in a small mixing bowl, drizzle in olive oil, sprinkle on your chopped rosemary, salt and pepper. Slice the cheese into 6 or 7 slices. Careful not to smash the cheese down as you cut. Using a very sharp knife, cut in a sea saw motion until you are half way through the ball, then firmly press through. 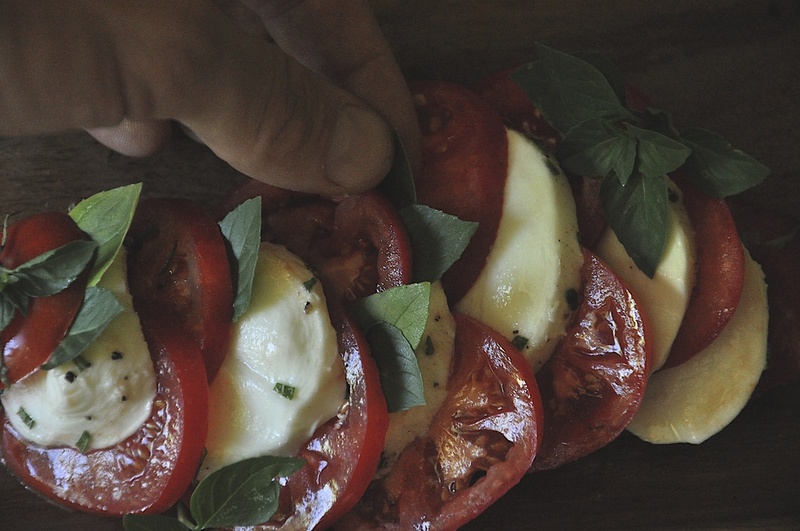 Gently layer 2 slices of tomato to every slice of cheese, and artistically stuff the basil leaves between each layer. Use the top sprigs of basil for a garnish. Then drizzle the extra herbed and seasoned olive oil from your mixing bowl, over the top of the salad. Generously splash a few spoonfuls of balsamic vinegar on top as well. The more the better. Make sure all of the tomatoes are generously seasoned, and decorate the board with some extra drops and smears of balsamic. Microplane some fresh lemon zest over the top to give it that fresh summer taste. 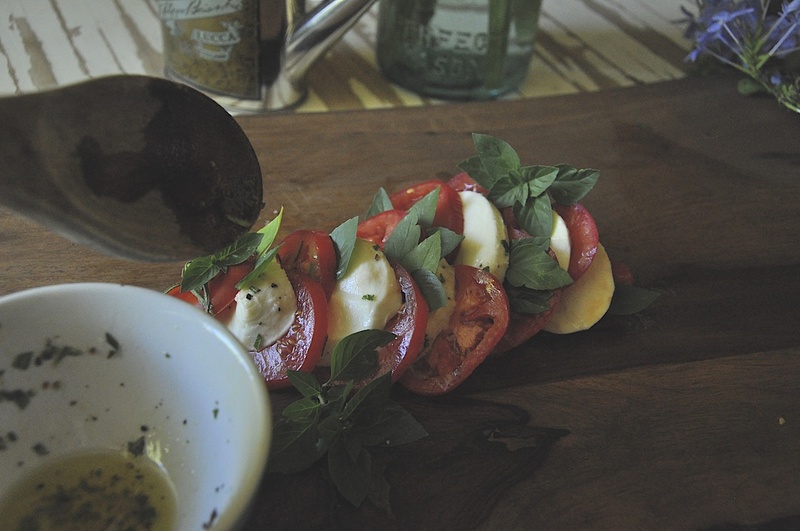 This was something new for me when it comes to a caprese salad, and I fell in love with the flavor combinations! This salad is beautiful on so many levels. The colors are refreshing on your eyes, and the textures and acids really make every bite better than the last. This is a go-to after a long day at work for us, or I add some chicken to it after the gym. Build it on a fresh piece of ciabatta bread. Forgetaboutit! Get creative with it and share this garden-to-table idea with the ones that you love. They'll eat it, and kiss you on the face. Take it from a Sicilian boy, "Conosco i miei polli."